P. Maenius was one of the moneyers for the year 194-190 BC. He is not otherwise known. Gens Maenia, occasionally written Mainia, was a plebeian family at ancient Rome. Members of this gens are first mentioned soon after the establishment of the Republic, and occur in history down to the second century BC. Several of them held the position of tribune of the plebs, from which they strenuously advocated on behalf of their order. The most illustrious of the family was Gaius Maenius, consul in 338 BC, and dictator in both 320 and 314. 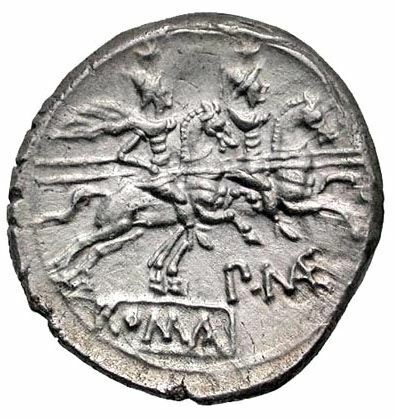 No surnames of the Maenii occur in ancient historians, but from the coins of the gens, we know that some of them bore the cognomen Antiaticus, in honour of the victory of the consul Gaius Maenius over the Latins in 338 BC, leading to the capture of Antium.